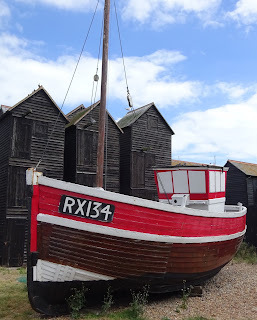 Last week I enjoyed a summer holiday of sorts, staycationing around the south east. It was an alternately relaxing and exhausting experience, showing me how many great places and activities there are a short journey from my home – and reminding me why it's as important to make the effort to explore this country. 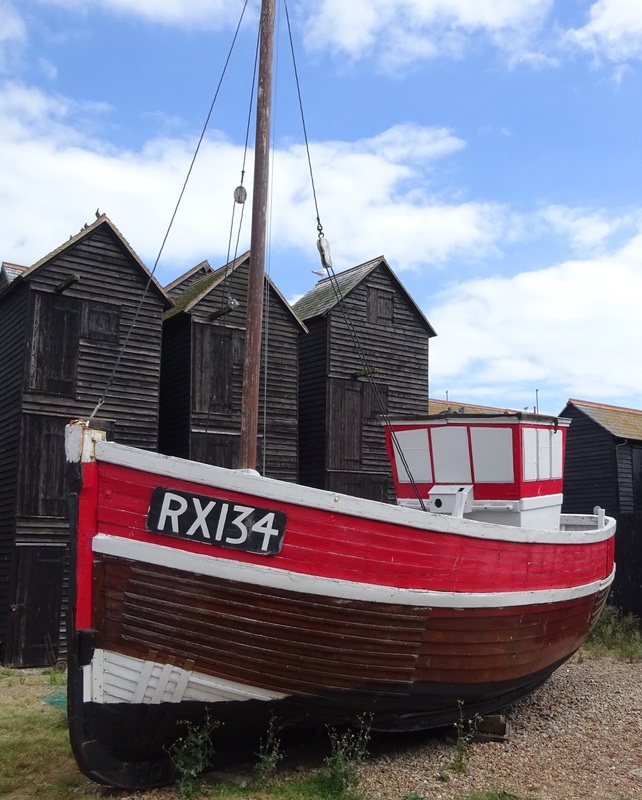 A particular highlight of the week, and one that took me by surprise, was Hastings. I've heard a lot about this seaside town but as comments have ranged from good to terrible it wasn't somewhere I'd made much of an effort to visit. Indeed, as we left the railway station and walked through the town centre it wasn't hard to see why there had been so much criticism. Yes it's a practical shopping area, but it's hardly a destination high street. Then we followed the seafront to the Old Town and all the praise made sense. Fishing huts and sea and quirky shops of all kinds, including a cliff top look out point so quiet it almost felt like we were the only two humans left in the world. Hastings is a place I've now fallen in love with and can't wait to return to. Of course, the fact there are three bookshops almost on the same street as each other also helps. We were walking along the bright and boisterous George Street to take a look outside the Boulevard Bookshop and Thai Cafe*, which I knew to be a few doors down from the Albion Bookshop*, when I spotted an unobtrusive A-board by the side of the road. More accurately, I spotted the word bookshop within the text of the sign, which was all that was needed to have me running off down a wide alley/small pedestrian street to find out more. My unknown destination appeared half a minute later as I turned left to see an unassuming shop front that didn't look particularly far removed from a remodelled private garage. Please don't let the odd location or simple shop front of Hare & Hawthorn Bindery & Bookshop put you off. A small bookshop space awaits, but it's light and airy and beautifully filled. Half the room is dedicated to bookshop, the other half to work space, which I assume is where the bindery part comes in. The room itself is a work of art and although stock is limited, every single item counts. 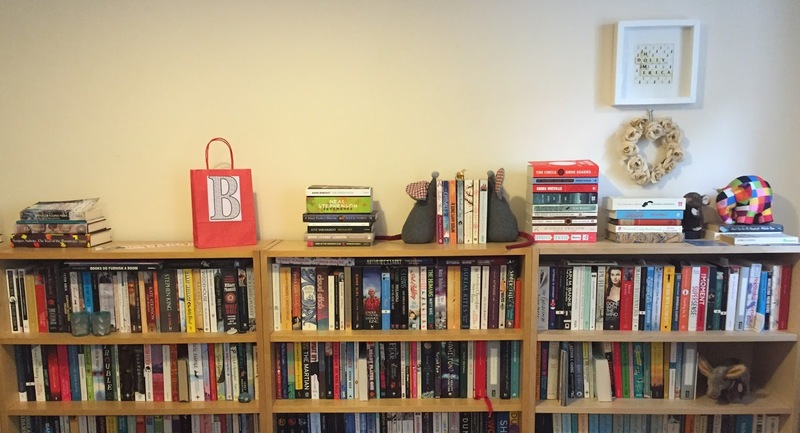 From a Billy bookcase of expertly-selected fiction to another for children, with a wall of art books in between, everything catches the eye and the mind. Throw in (at the time of our visit) a display dedicated to Tove Jansson, another for Persephone, non-fiction treats and a table topped with beautiful stationery and Hare & Hawthorn is a true delight. For our visit The Ragged Trousered Philanthropists by Robert Tressell was the buy of the day, but I could happily have gone home with around 95 per cent of the bookshop had money and bag space allowed. 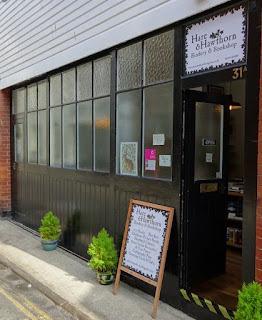 Nothing about Hastings was as I'd expected – especially this beautiful bookshop find – but everything about our visit made me fall in love with the town and become determined to return as often as possible. Which is exactly what I suggest you do if you find yourself at a loose end during this long weekend. *I decided to prioritise one bookshop this time to ensure I had another reason to return very soon. If three times is long enough to make a tradition, it's become mine to mark this blog's birthday with an annual review. 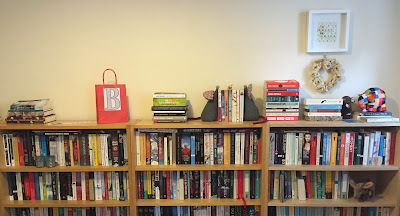 The whole aim of this blog is to encourage readers to visit their local bookshop and, in my own small way, to try to make a difference to the fortunes and futures of bookshops everywhere. However what I didn't count on when I started this journey was the difference this blog would make to me. And I don't mean in terms of overcrowded bookshelves. Before I began The bookshop around the corner, I was unsure if I could even write. My experience of putting pen to paper involved a job correcting other people's work, which is a very different role to finding the words yourself. It was a job I enjoyed, but now I look back perhaps not one I loved. While satisfying in itself, the work wasn't taking me anywhere or pushing my abilities, which pretty much sums up how my life was at that time too. Then I started writing and – more importantly – setting off on adventures around the country to meet total strangers. They had no idea who I was or why I was so excited to be meeting them. This blog adventure took me out of my daily routine and tested not just my writing, but also my confidence, ability to talk to strangers and more: it brought me back to life. It also challenged my map-reading skills (still terrible – I gave in and bought a sat nav). Within three months, I was telling you I had a new job. Within a year, I'd moved to a new town. Three years saw me acquire some company on my journey. What probably seems like slow progress to many of you has been a massive change to this girl who'd got used to her comfort zone. Particular moments of bravery have included travelling hundreds of miles to stay with internet strangers* and overcoming my fear of travelling to France. But looking back, the changes have really been all about the little things. From struggling to speak to someone or realising I'm not completely ignorant, to overcoming the intimidation of cool or even beating my own prejudice, each of these encounters has added up and – I hope – made me a better person. They've also been a heck of a lot of fun, even if I'm still not worldly wise enough to know how to deliberately haggle. This blog got me out into the world and introduced me to some amazing people and places – ones I'd never have dreamed of meeting in the small life I was previously living. 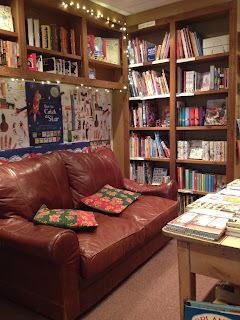 I may have been the one who made the decision to leave the sofa and start adventuring, but it's the wonderful welcome each bookshop has given me – and the different experiences their various collected shelves and people have had to offer – that have ensured this blog has had such a positive effect on my life. So thank you to every bookshop I've met so far and to every one of you I'll meet in the future. I'm not sure how much of a difference I'm making to your lives, but mine will never be the same again. Finally, please remember how much more fun it is to visit a bookshop** and enjoy all its collective experiences instead of clicking on a website. *Don't do this yourself. Or if you do, please make sure you have taken all the appropriate safety precautions. **When you do pop into your local (or any other) bookshop, feel free to share the joy with a guest post. My love of Wales and various connections with the country mean I've spent much of my life shuttling back and forth between here and there, but this post isn't about Wales, it's about the bit in between. It's a journey I know like the back of my hand and one I've come to enjoy much more now I've got into the habit of taking interesting bookshopping diversions. I made one of those diversions at the start of the year (sorry for the delay in writing) when I took a detour through a county I've long wondered about: Gloucestershire. I have friends from the area and know its reputation for beautiful countryside and delicious cream teas, but until this week's bookshop I had no first-hand experience. Tetbury is an attractive small town north of the M4 and the diversion from the motorway gave me lots of time to appreciate the scenery and the smartness of the Cotswold stone buildings. It's a very beautiful part of the world and my drive was a good reminder of why journeys should be appreciated for what they are, rather than suffered for getting in between A and B. On this occasion, the main thing between my A to B was The Yellow-Lighted Bookshop, which is a surprisingly large place for the size of the town it serves. Fiction welcomes you through the door and guides you around a corner into the shop proper, which was welcomingly warm on that bright but chilly winter day. I gently defrosted while taking in the atmosphere. Despite, or perhaps because of, the time of year, browsers appeared to be a mix of visitors to the area and locals, and I was particularly pleased to see how many of us out-of-towners were there appreciating the bookshop as part of Tetbury's many charms. The friendliness of the place was obviously an important part of this, but the bookshop itself is worthy of destination status. The smart wooden shelves give the books a look of importance and had me wishing I could model my own library on my surroundings, while a squidgy, comfy sofa halfway down the long room (on the way to non-fiction) reminded me this is very much a place to relax and feel at home. 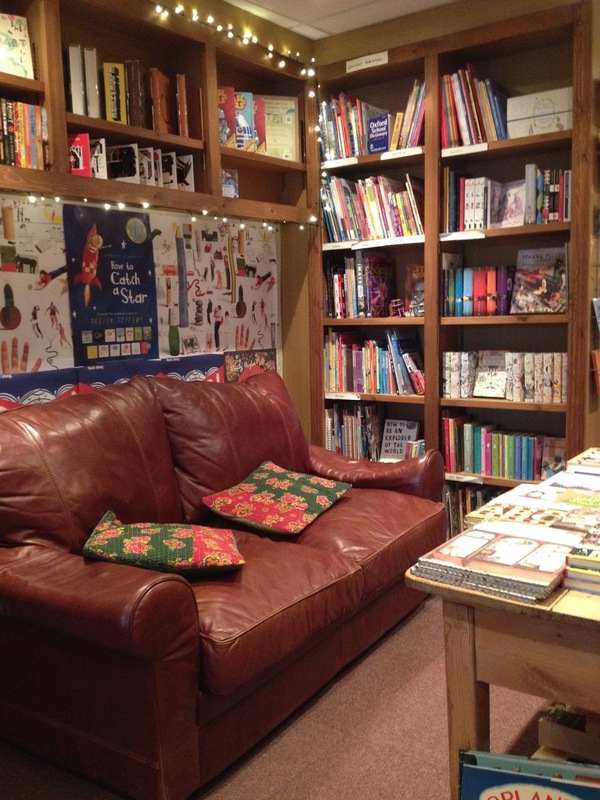 It was here that I sat and admired the various collections of Swallows and Amazons on offer. One of these almost came home with me – until I returned to the general fiction shelves and became even more engrossed. As with all good bookshops, the stock is a mix of titles everywhere should offer alongside the individual choices of the bookseller. Here I found a really varied selection, with lots I'd not seen before so I soon found myself with a long list of potential purchases to whittle down. The Shuttle by Frances Hodgson Burnett, published by Persephone, held my attention the longest as I read what must have been the entire first chapter while stood in the bookshop. I was drawn to this for the distance (geographically and socially) separating the story's two settings and now I've finished reading I can tell you it's a brilliantly observed page-turner. I also picked up Julian Barnes' A Life with Books. Books chosen, I said hello to the friendly bookseller before heading out to explore the rest of the town. It's an attractive place with some interesting buildings, nice places to eat and – at least at the time of my visit – its own model Shaun the Sheep. All of which mean Tetbury is well worth a visit, if you're able to tear yourself away from the bookshop. *I had planned to visit that second shop before publishing this post, hence the delay in writing, but life got in the way so I'm having to wait a little longer. Should curiosity get the better of any of you, please do visit either branch of The Yellow-Lighted Bookshop and ask the question for me. You'd be welcome to share the answer (and the rest of your bookshopping fun) to appease readers' curiosity until my next trip to Gloucestershire. The weekend just gone saw me on a last-minute trip to Stratford-upon-Avon. Despite many years studying English, this was my first visit to the town and I was completely unprepared. Other than a place to sleep we had nowhere to eat, no knowledge of what tourist attractions were on offer* and no idea about the town's bookshop status. As you can imagine, the latter was the most aggravating. We arrived early on the Saturday evening, at exactly that moment when the town is starting to quieten down as theatre-goers take their seats and shoppers recover at home. It was a lovely time to begin exploring, but not a good time for randomly finding a nice restaurant with a table going spare. Instead we took the opportunity to wander and locate all the important destinations: bookshop, check x2; visitor centre, check; and eventually a very nice restaurant which offered us a late table. 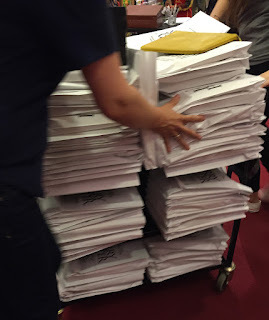 But what does all this have to do with the bookshop blog? I hear you ask. Well quite a lot as it happens. Because although we found two bookshops, the discovery occurred long past closing time. Which meant the chances of me (legally) getting inside either were slim to none, especially given one, Chaucer Head Bookshop doesn't open on Sundays (I'll be back). That left me with the friendly neighbourhood Waterstones. 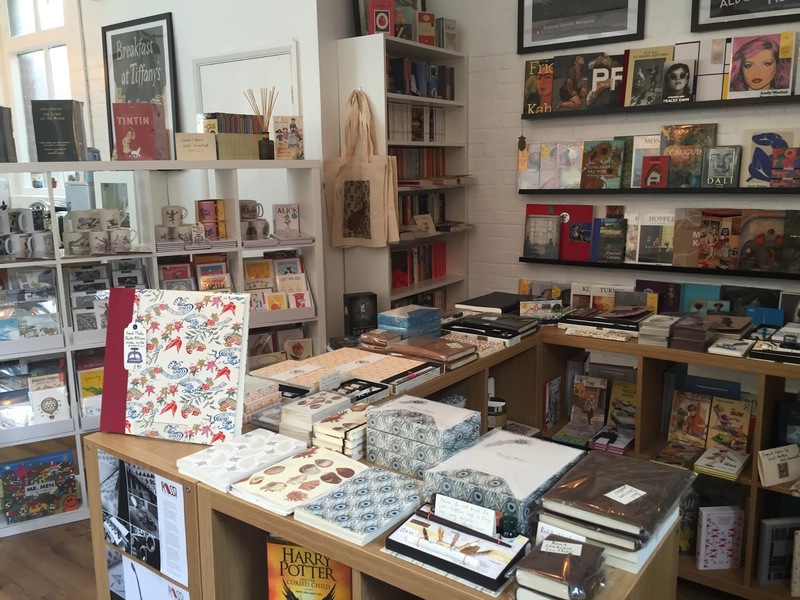 We've already established I like all bookshops, but by now I'm sure you've noticed my priority is to visit independents unless there's something really special going on. Well what could be more special than accidentally finding myself outside a bookshop that's open at 11pm on a Saturday night? Late night openings are not exactly a common occurrence, but for those of you who haven't realised what day it was: Harry Potter and the Cursed Child launched an hour later at midnight. As I'm not a massive fan** I'd completely lost track of the launch date. 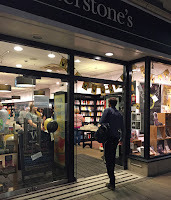 I knew bookshops around the country would be opening especially to unite fans with the latest book but it hadn't occurred to me to find out more and go along because I'd felt like I'd be intruding on the Potter fans' excitement. However, when I found myself outside an open bookshop late on a Saturday night I realised it was impossible for me to stay outside. The bookshop was buzzing. It's not often I see this level of crowd – and especially not so many predominantly young readers – and it was a joy to see. Admittedly lots were simply wandering or sitting in groups, waiting for the clock to strike 12, but many more were browsing and buying. Which is exactly what we did. 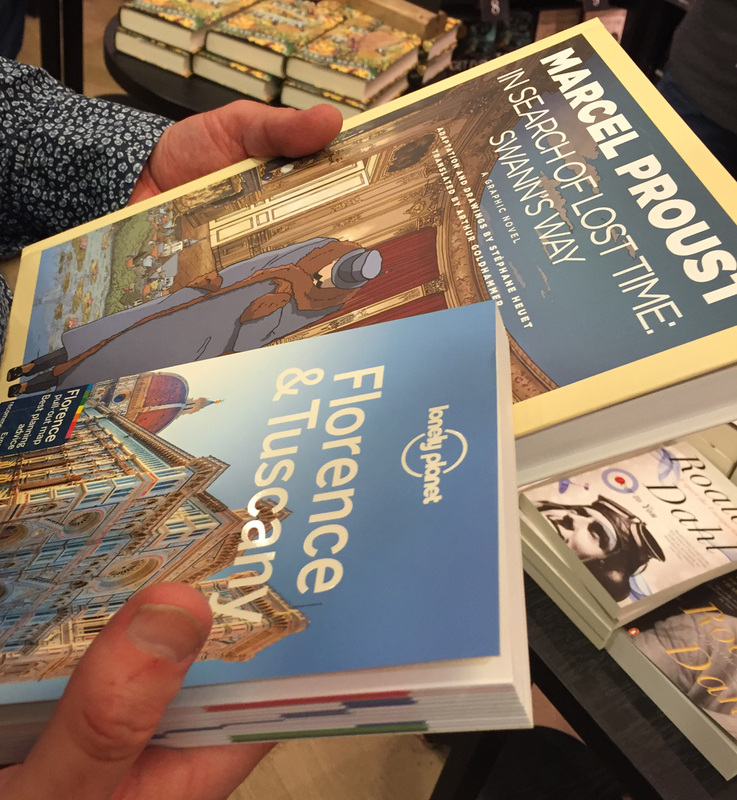 We were on a mission to find a guide book to Florence, but making the most of two floors of bookshop and weaving in and out of the crowds it was only natural we explore all two floors. This weaving saw us stumble across the graphic novels, where he also picked up a striking adaptation of Marcel Proust's In search of lost time: Swann's Way. I'm planning on (one day) borrowing it from him in a cheat's attempt to find out what all the fuss is about. Books bought, it was time for the main event. We found a convenient spot out of the way of the queuing Harry Potters, Hermiones and more, and waited as the countdown began. Then all of a sudden a trolly of books in paper bags whizzed past and the books were being handed out. There were smiles and squeals of happiness as the young and not-so-young eagerly tore into their packages, with one girl even doing a little dance for joy. It was really lovely to watch and although we weren't a part of the Harry Potter frenzy we were still involved in the atmosphere and general excitement of picking up a new book. Next time a new book prompts a midnight opening I'll be there, and if you've any enthusiasm for the pleasure of book-buying I'd encourage you to come along too. 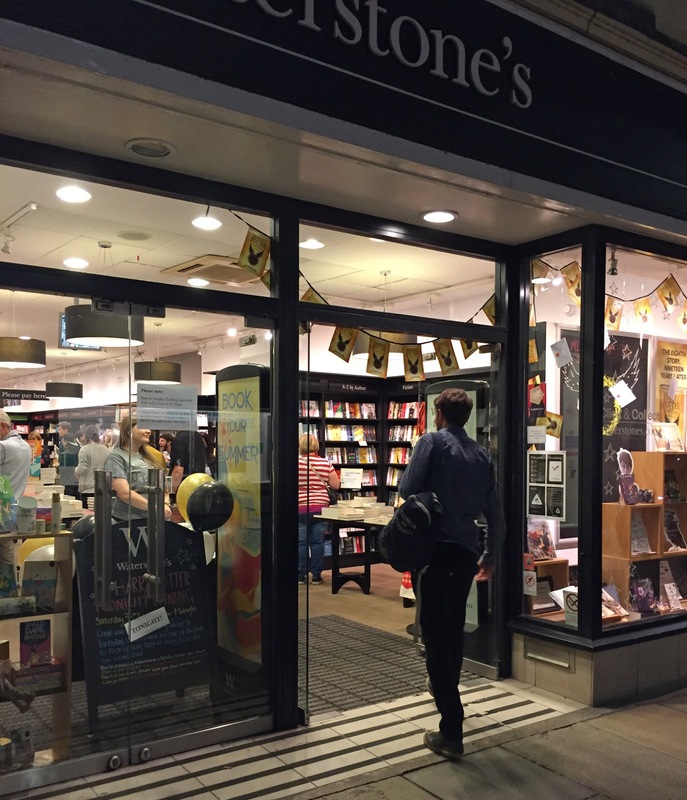 The atmosphere was great, the novelty of late-night book-buying was fun and – obviously – everyone was welcome. *Slight exaggeration, I'd heard of Anne Hathaway's cottage but I hadn't realised it was out of town and therefore not within walking distance on a lazy Sunday. ** Please don't lynch me. I like Harry Potter, but I'll wait to read the book once the hype's died down.